KB2770917 undo the fix. Applying my application after the fix will work, but installing the KB with installed fix will result in Modern UI at start. – I will check some other approach to make changes permanently, but I don’t have much hope on it. MS don’t care about redundant files, they provide packages with all files which are related to their update. In Windows 8, Microsoft has prohibited the user to log on straight to the Windows Desktop through a system licensing policy. Due to this policy, you always have to start with the Modern UI. If you’re a power-user, or you just want choice, you should be able to boot your system straight to the desktop. I’m not against the Modern UI, and I have no problem with the start screen, but I’m pretty sure I (and many others) don’t need it right from the beginning of a session. It is also annoying to use some of the current solutions out there as all they do is skip this screen on every sign-in, but this results in showing the start screen for a split second, which can be a very jarring experience for the user. After a lot of work and research I finally think I found a native way and maybe the cleanest solution to bypass Modern UI during sign-in. Therefore I wrote an application to skip this behavior. Modern UI is not disabled. It all works, only the sign-in behavior is affected. I searched the web to find an answer how to bypass Modern UI after login. Microsoft’s last statement is there is no way to avoid Modern UI on logon. Right. Because they have a licensing policy in the System which doesn’t allow the user to directly logon to Desktop. All of them do the same and trying to ‘run’ Desktop after logon. This is not the way it could be done, as we all can see with Windows Server 2012. Windows Server 2012 has this fast and fluid experience many people want to have and not Modern at startup. Credit to all of you. DISCLAMER: I can’t be held liable/responsible for any loss/damage/discomfort occurred as a result of using this application! This application is based on a script but now is ported to an application for better errorhandling and easier feature improvements. I recorded a Video to show you how the sign-in looks like before and after. You can pause the video at the beginning and read the description. Or you can just skip to 2:45 to see the sign-in experience. Pulls out the system policy which prevents users to login directly to the Desktop. In addition to the “Bypass Modern UI” application I may provide some undocumented nice tweaks which let you customice the Boot Experience. It can take 2 restarts to take effect! I’d like to suggest a feature : could u incorporate a token backup of your current activation, and have it reinstate after installing ? wouldn’t that solve the unactivated problem? It does not work on Windows 8 Pro. I believe that this policy only works on Enterprise, as a “special feature” for Volume Licensing Custormers. I tested it extensively on Win8 Pro 32 Bit. And after finalisation on 64 Bit. It all worked fine. You would be the second reported one who things it didn’t work. Someone reported he needed 3 restarts. I guess in some cases it taks more than this. This is not just only for Enterprise as I mention all regular Activation methodes (KMS, MAK, Retail). You can contact me in german for furher questions. Hi, I think I find the solution for the problem. When I tested the program on Win 8 Pro x64 already activated, after I restarted 3 times I noticed that nothing happened and the licence was still activated, so no change at all. But surprise, instead of uninstalling I choose the Reset button from the program and after restart now it works fine, I can boot right to the desktop. But it stopped working after I verified again the status of license from System option. So this gave me an ideea to reverse the operation. I reinstalled de program and after I closed the installer I opened System from lower left corner of the desktop (with right click), I waited to refresh the license status in then I closed the window and restart. Now it works, but the only drawback is that after the sistem enter in desktop mode, for a fraction of a second, appears a command prompt window and then disapears. Not very annoying anyway. I filmed with a camera and I noticed the following text in that window: “The operation was completed succesfully”. I tried this metod on Win 8 x86 and worked again, but here I don’t see any command prompt window, even the sistem is way slower than that with Win 8 x64. So thanks for your effort. Maybe it will help to investigate further. Reset = Restore. This should bring up the old status. Unfortunatly I don’t really get it. When did you restart? Immediately or after a while? And why is there a command promt window? Did you upload the video anywhere? Yes, my mistake, I clicked on Restore buton, because I was afraid that I will lose the state of activation. So, after 3 unsuccessfull rebooting, I wanted to restore the state of the system. I clicked Restore and then I restarted the system, but for my surprise now the boot sequence skipped the metro interface. So I restarted again to verify and again for 3 times in a row. But after I opened the System window to verify the status of the activation, after restart, the system acted like original with metro interface. So I figured out that the culprit is that opening the System window, in fact, activated my restored state. Well, I tried then to install again your program, but before restart I opened again the System window. Perhaps this action of rechecking of the activation status it’s what is need to activate the new state of modified licence. After restart now the system entered without metro interface. And the comand prompt window appear for just a fraction of a second, I mean you can’t even see what is in that window therefore I filmed with a poor camera to see if is any error message, but it was only one row of text: “The operation completed succesfully”. Important thing that now is working. Maybe other can confim that situation. Now I don’t have that camera, but if you think it is very important I will try to film again and upload somewhere. Hm… there are some command line process but they are all hidden. It would be the very first time that I would see any of those windows. Don’t mess around with your system. – I may will update the tool in a few days with some force option and command line. here is windows 8 core x86 rtm installed in vmware and real pc, reboot one time to take effect in vmware, reboot two times to take effect in realpc. I will talk to my collegue if we can implement this. Modern UI is not disabled. It all works, only the sign-in behavior is affected. WOOOOHOOOO… Thank you very much! 1. Donor!!111!! As promised, I made a 2. donation for your tool which works perfect for me. Better than any other solution I used to try out so far. 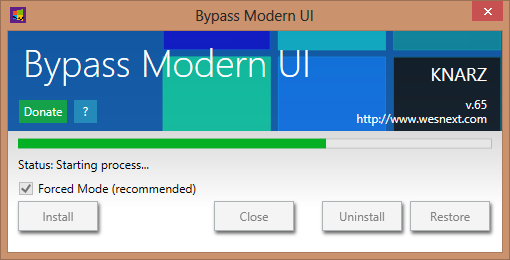 I installed Bypass Modern UI on an upgrade Version from Windows 7 Home Premium 64-bit to Windows 8 Pro 64-bit as a regular upgrade as well as a clean install option without any problems. Thank you for this tool. So is it safe to install on Windows 8 if I already activated my licence? Read carfully the conditions. It’s sufficient explained. I used Modern UI on my activated version of “Windows 8 Pro with Media Center”. Metro UI was successfully bypassed on log in and I did not have to reactivate my product key. Thanks Knarz. Worked well for me. Glad to hear! – But some testers reported losing the activation state, so I wrote it as a fact. But some hadn’t to activate again. Thanks for the Feedback! I had the same symptoms as TGW – After installation – rebooted 3 times without success. I have run the restore option, rebooted and it start to work. Unfortunately after going to Control Panel -> System -> View details in Windows Activation it again reboots with MetroUI – I did not loose activation etc. Windows 2008 PRO 64BIT MSDN retail. I tested your program today (WIndows 8 90-day evaluation copy) and I must say, that I’m amazed! It should be available in Windows 8 from the beginning. You wrote “DISCLAMER: I can’t be held liable/responsible for any loss/damage/discomfort occurred as a result of using this application!” – I hope it’s just about software, not hardware, right? I’m going to install your tweak when I get full version of Windows 8. One last thing: Is it possible, that your tweak may somehow casue some kind of errors/problems in the future? This line is just to protect me in any way. It’s provided as it is and you use this tool on your own risk. It only does basic commands, no kind of Hardware is involved. Chris123NT told me that WU got broke, but I never could reproduce this issue and no one else reported anything similar or something noticeable which was caused by my methode. I wrote you a mail but you haven’t answered. Which Windows Version is this 32 or 64 Bit? Thanks! This really works. Doesn’t even show the metro screen at boot. Just straight to the desktop. Breaks something on my Win 8 Pro x64. Tried multiple restarts and the feature works fine boots to the Desktop all the time. But Windows Updates failed after installing. Got a scary bootloop of “Failed to configure Windows Updates. Reverting Changes” for three restarts in a row and then got back to Metro. Also Outlook 2013 crashed after installing the patch. Both before and after the WU reverting loop. Used the Restore button and everything works fine (as before, boot to ModernMetro) now. Hope you get this to work or find another solution as it would be a nice feature. Hm, after reverting Windows seemd to create ‘repair’ themseld, recreated and recreated the token. I’m not sure which patch you mean that ‘break’ your office 2012. More details step by step please. Restore is exactly for emergencies like this. I will check the updates later if MS may really adressed this workaround. I’m back again with some feedback . On the sistem with win 8 x86 I used version 0.6. There was no command prompt screen and the update was succesul. But on sistem with Win 8 x64, I uninstalled version 0.6, I installed version 0.65 with hope that command prompt window would dissapear. Unfortunatelly it was the same situation. For me is not a big problem because, like I said, it appear and dissapear under 1 sec. But I can confirm I was unable to make the update from 13 november. So I used the Restore option and the all was ok. Now I will wait with Metro UI activated until you make a new version. Maybe I will get rid off that comand prompt window too. Never change the tool because of different versions. They do all the same! There are just minor adjustments or improvments for the install routine. Nothing more at all! There is never a command prompt window from this application while or during sign in (so never on every logon – it can’t be)! At it’s max there could pop up a windows while once the installation. Never ever after this single action (install)! There is no task, application, service or anything else running in the background. It is really native. First of all I want to say that I really enjoy your program but I came across some bugs. Yesterday, I updated Windows Update (To be able to update office products). So I don’t know if the problem is due to the fact that I updated Windows Update or that I did the Office 2010 updated. After the updates, Metro UI came back on its own. I tried to install your thing again and an error message appeared. Here is the screenshot if it can help you at all. This is little complicated than. Appying again shouldn’t work either. If anything goes badly wrong you than have a Backup to restore all licenses with ATM. Im experiencing the same error. Could you please provide a link to the original version of the program? Thanks! I did not mix any versions and also I tried your suggestion already and same thing happens. I will provide a small cmd fix within the week. I never thought MS would update license files, but they do all the time… unfortunatly. Maybe with this update management from MS my fix becomes obsolete. I really like this tool, is simple and clean. However, I do noticed few things which I find it quite unusual, I do not know if it was intended or not. 2) After installing the tool, I found that I can not access the “Change PC settings” at all. 1) Error was never reported and I’ve never seen this. I guess it’s not related as I also can’t see any relation to this. 2) Do you use Server 2012? – I can access the Change PC Settings but this could be caused with Server 2012. Yes, I can see why 1st one might not be caused by this tool, might be something on my part. I found a fix last night that solve this problem (right click on intended software > add to start menu). On 2), no I do not use sever 2012. Simply Windows 8 Pro. Windows 8 pro (6.2.9200) – this tool works fine. Thank you! I get an trojan virus alert when downloading the zip. Thanks for your comment. Site is not hacked, just false positive alert. Checked the binaries 2 min ago.